As part of the Winter fundraising program, the Office of Development recently sent a unique appeal in the mail. As with previous winter mailings requesting support for the NSDAR General Fund, this mailing included a “gift” offered for considering our request and in grateful anticipation of your generosity. However, this “gift” is quite different from those sent in previous mailings. 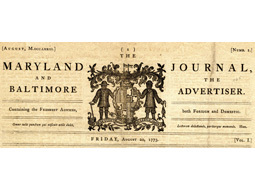 Instead of labels, greeting cards or a magnet, this mailing includes a beautiful reproduction of a 1773 newspaper, The Maryland Journal and Baltimore Advertiser. Printed in the USA on aged-looking parchment paper stock, this newspaper has many interesting features, including an advertisement on the back page of land for sale in Ohio by George Washington. By 1776 this newspaper was headed by a woman, the founder’s sister, Mary Katherine Goddard. A true patriot, one of her many claims to fame is that she was the first newspaper editor to print the Declaration of Independence, complete with the names of all of the signers. Many of you are familiar with reading other 18th Century documents, but for those of you who want a little help with interpreting the “long s” (where an “f” appears in place of an “s”), please read on. The odd-looking letter known as the long s (or long ess) is believed to have derived from the old Roman cursive medial s. In the latter half of the 18th Century, when a greater distinction between uppercase and lowercase letter forms became established, the long s developed a more vertical form, looking more like an elongated s or a lowercase f.
The word “Bishop” with a long s that resembles an elongated “s,” as it appears in the paper, on the bottom left corner of the front page. To modern-day readers the long s is often confused with the lowercase f. This confusion is understandable, especially when the long s is written or printed so that it resembles a lowercase “f,” with an f-like nub at its middle, but usually on the left side only. 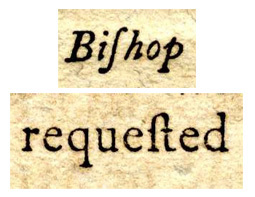 The word “requested” with a long s that resembles an “f,” as it appears in the paper, on the top right corner of the back page. During the time of the American Revolution, this older form of the letter “s” was often used at the beginning or middle of a word, but only rarely used at the end of a word. The double s in the middle of a word was sometimes written with a long s and a short s, as in the word “meſsage.” Yet in the sample of the 1773 issue of The Maryland Journal and the Baltimore Advertiser, shown below, we see the double s written as a long s paired with another long s. You may see this version in a detail of the land ad posted by George Washington taken from the third column on the back page of the newspaper. Although the long s fell out of use in the early 19th Century, a number of important Revolutionary War documents in our care contain wonderful examples of this forgotten letter variation in both handwritten and printed form. Your donations to the NSDAR General Fund help safeguard and maintain over 30,000 paintings, documents and other historical artifacts in our care. Your generosity enables us to care for these treasured artifacts and preserve not only the words of our patriot ancestors, but the form in which those words were written. If you would like to receive your very own reproduction of this incredible document from our collection, simply make an online donation of $25 or more, or call the Office of Development at (800) 449-1776 to make a donation over the phone. Thank you so much for making these treasures possible and preserving items like this for generations to come. #TBT 125 years ago, on April 19, 1894, the Sequoia Chapter in San Francisco, California, planted a �... 19 hours 13 min ago.